Believe it or not… this shoot was done when it was only a whopping 37 degrees outside. It was so COLD!!! Nikki was such a trooper and embraced it. 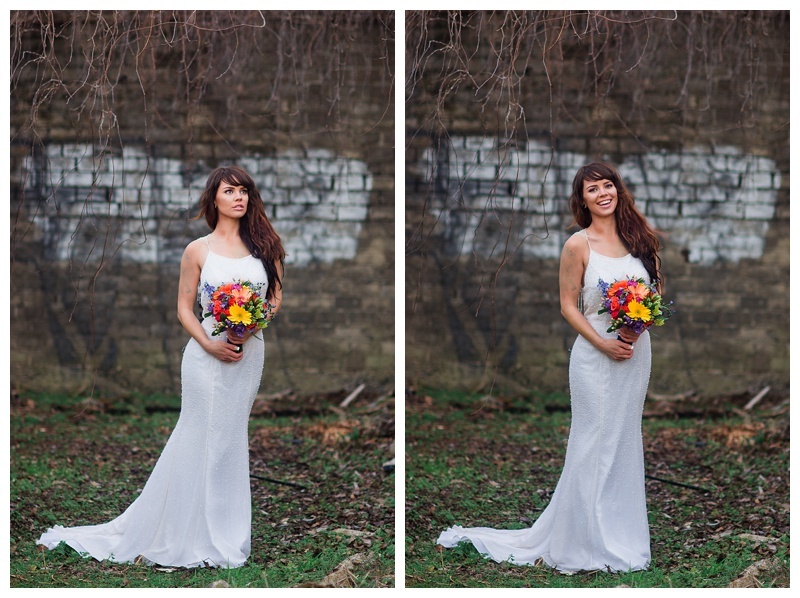 We got some seriously amazingly gorgeous shots and I am so thrilled with the results! We found this really awesome abandoned house in Little Rock so I stepped out of my comfort zone. I'm used to shooting in pretty spaces rather than grungy so it felt really nice to expand my creativity. Alison Hobson did such a great job with the florals. I gave her a free reign and she really outdid herself. She came up with some really beautiful pieces! We decided that we were going to do a photoshoot about a week before it took place so I was pretty impressed with how she was able to come up with some awesome pieces given the short notice. I love doing shoots like this where you shoot for yourself with your own concepts. It lets you squeeze your creative muscles. Sometimes you can get in the habit of shooting the same things, so it's always really nice to mix it up! You'd never guess, but this gorgeous dress she's wearing cost a whopping $13! I was mega impressed. It shows that you can really make the most out of the materials that are around you. We all carpooled to the location since I hadn't actually been there before. Jeremy, the photographer that I shot with, had made some hot chocolate and had it in a huge thermos. After the shoot, I was dying for something warm. I guess I was so focused on hot chocolate that I totally forgot to grab my camera bag out of his trunk when I got back into my car! Nikki must have been focused on the hot chocolate too because she left all of her clothes and shoes in there too. I got a phone call from her on my way home saying that she left her bag. I hung up and realized I'd left my bag too! How silly. I just found it hilarious that we both forgot our stuff, haha.